We are living in the digital age where data is the primary currency. It only makes sense, then, that innovative young companies are taking collection to the final frontier. Planet Labs is a remarkable business. This tiny San Francisco company plans to continuously surveil the entire planet from space. And they’re using mass-produced smartphone parts to do it. The idea is not as crazy as it seems. And it is indicative of the new opportunities in space. The company was founded in 2010, as Cosmogia. A trio of NASA engineers became intrigued by the development of smartphones. Even then, the devices had more processing power and better sensors than very expensive satellites. They saw a rare opportunity to disrupt aerospace. They called it agile aerospace. Chris Boshuizen, Will Marshall and later Robbie Schingler began building mini satellites from off-the-shelf sensors and cheap smartphone components. In 2013, three pint-sized satellites named Alexander, Graham and Bell were launched at a development cost of only $7,000. Later, software modeling and the commoditization of sensors pushed prices even lower. Planet Labs’ “release early, release often” business model made the company cost-competitive with giant companies building much larger satellite systems. Their ambition, and early success, attracted venture capitalists. The idea that began with a handful of idealistic guys in a Silicon Valley garage, became a real business. In 2014, Planet Labs dropped a flock of 28 miniature satellites, called Doves, into low orbit from the International Space Station. Iteration continued. Like smartphones, every new model got better specifications and became less expensive. At the end of 2017, Planet Labs had 130 low-orbiting Doves in operation, enough to produce high-resolution imagery of every place on Earth, every day. And they’re only about the size of a shoebox. Planet Labs is essentially a “line scanner for the planet,” Will Marshall, founder, told a Ted Talk audience in Vancouver 2017. Every day, each Dove produces 40 gigabytes of data and snaps 10,000 pictures covering 770,000 square miles — an area the size of Mexico. Even with the most powerful government satellites, this has never been possible. And it will only improve and speed up as the company uses algorithms and machine learning to make greater sense of its data riches. Marshall has always promised Planet Labs would democratize access to the world’s information. He feels the company has an obligation to non-governmental organizations, corporations, scientists and journalists to illustrate how the world is changing every day. • Precise, up-to-date information can help oil drillers monitor site safety. • Investment analysts can glean insights about crop yields, container shipments or even shopping mall traffic. • Weather-watchers can better predict, pinpoint and monitor natural disasters, glacial flow (down to cracks in the ice) and even help identify escape routes in flooded areas. In 2018, Ted Stuckey, head of the global innovation lab at QBE Insurance Group, Australia’s largest insurance company, told Insurance Business Magazine that imagery from Planet Labs fundamentally changes its relationship with customers. The comments speak to the powerful business incentives underlying the new space race. It’s about procuring and using data to strengthen business models. The irony is space, just like media, retail, manufacturing and almost every other sector, is being disrupted. Young, idealistic entrepreneurs are using the tools they have at hand, a bit of ingenuity and brash, to cut prices and forge new business models. 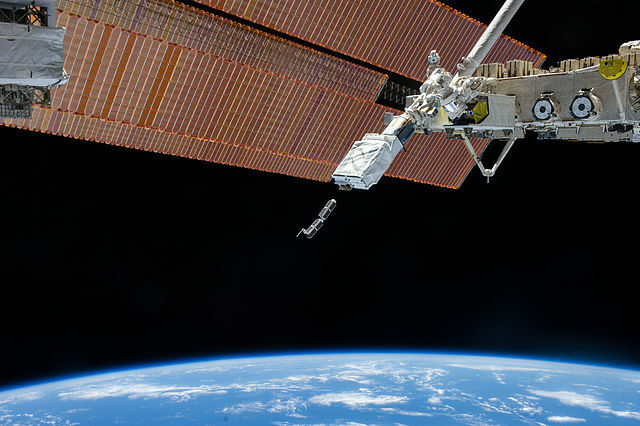 A current Planet Labs satellite, the size of a shoebox, costs a few thousand dollars. Yet it produces better images than satellites the size of a compact car. The three-ton Solar Dynamics Observatory, launched in 2010, sported a cost of $850 million. In aerospace, that sort of thing is not supposed to be possible. Legacy companies are supposed to have inherent and protected advantages so then can maintain high prices. There is a distinction. Some parts of aerospace, like military applications, are always going to be protected. I encourage my members to buy the shares of companies like Lockheed Martin (LMT), Boeing (BA) and Northrop Grumman (NOC) on pullbacks for this very reason. The other parts — aerospace, and the commercial interests like telecommunications and imagery satellites — are now fair game for Silicon Valley data grabbers. This means new business models, and new opportunities for investors. P.S. There is a legitimate renaissance in all things dealing with space. Planet Labs isn’t publicly traded (yet), but there are plenty of companies making the parts that go into this kind of cosmic technology. And you can watch their profits take flight right from where you’re standing now. Click here to get on board. Thanks for the very interesting video. Amazing! The data will be available to everyone?… I’m sure the NSA will be loving this to be able to track every citizen/vehicle location etc. on a daily basis…not that they don’t already… 24/7 world surveillance in real time takes another step forward.